Where is Mason Row located? We are located in downtown Cleveland. I am trying to redeem my code and it's not working? If you have a online flash sale redemption code such as Groupon or Living Social, please make sure you are registered and putting yourvoucher code into the 'Voucher Code' box, NOT the 'Gift Cards' code box. Click 'Apply Coupon', and you will see the value of your code taken off your total, next to the word 'Discount'. The 'Gift Cards' code box is for Gift Certificates only. In addition, you must register on our website in order to apply a voucher code to your order. If you have an expired voucher code, please email a screenshot or picture of your voucher code to customerservice@masonrow.com and you will recieve a new valid code for the amount you paid for the Groupon. We cannot honor any expired Groupon codes for the full value, but we will issue you a new code for the PAID value. If you have a redemption code from a Personalized Gift Box item, please redeem your code on redeem.masonrow.com. I selected my design, personalized it, and went to check out and my shopping cart is empty. What happened to my design? Our software requires that your browser accepts cookies to be able to complete the purchase of your personalized stamp. Please make sure that your browser does not block cookies. Do I have to register in order to check out? We do need customers to register, so that our system can send you update emails when orders are received and shipped. I have two or more Voucher codes to redeem. It applied one, but why won't it apply the second code at checkout? Unfortunately, our system can only accept one discount/voucher code per order. 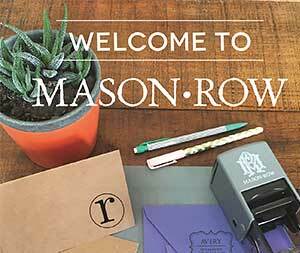 Multiple voucher codes must be redeemed as separate orders, or email customerservice@masonrow.com with your Groupon voucher codes prior to your purchase and we will combine them into one code for you so you only have to pay shipping once. Additionally, we can only accept one promotional offer code per purchase. So please choose wisely. My credit card statement shows that I was billed by Royal Acme. Is that Mason Row? Yes, Mason Row is owned and operated by Royal Acme. Can I order different ink colors for my Single Self-Inker or Trio Self-Inker? Yes! The 10 colors we offer for Traditional Self-Inkers/Trios are: Midnight Black, Mocha Brown, Mediterranean Blue, Blueberry, Candy Apple Red, Cool Mint, Purple Rain, Sunset Orange, Wintergreen & Passion Pink. These are interchangeable in all single as well as the new trio traditional self-inking stamps as of July 2014. How do I switch out my Self-Inker's ink pad to use a different color? First, hold the two buttons found on the sides of the stamp down as you slowly push down on the stamp. You will hear/feel a click as the stamp locks into the first changing pad position. You will now be able to carefully slide your stamp pad out with your finger. Slide the new ink pad in (remember, inked side down), and push it into place. Before you release the locked position, push down on your stamp all the way while holding the buttons again....you will hear/feel another click and now you can clean you rubber design with a rubber stamp cleaner or just a damp paper towel will suffice. This cleaning step is not necessary, but it helps keep your new ink pad color clean. Once you clean the surface, you can push down on the stamp to release the lock, and stamp away! How do I switch out my Trio designs? Our Trios are super easy to interchange the 3 designs. Pull out the design you want to use out of your storage stay and lay it down on a table or flat surface. Position the stamp over the die and press down. The die will snap into position and will be ready to use. How long will these stamps last? All of our stamps are made to last years, and thousands of uses. The self inking stamp pad typically lasts 800 to 1000 impressions, depending on the material it is being stamped on (some being more absorbent then others). If yours is defective in any way, please let us know immediately. How do I store the additional ink pad (Self Inking Stamps)? If you take the black ink pad out to use a different color, please put the cap from the additional ink pad on the black ink pad when not in use. This will help keep it from drying out as you use the colored ink pad. Placing the extra pad in a zip-top bag out of ditrct sunlight and warm areas may increase the longevity of your ink pad as well. If I upload my own custom art, what part of the design will print? The BLACK PART of the art you submit will be the part that prints. So please do not submit reversed or inverted art. If I live in Alaska or Hawaii, which shipping method should I choose? Because we ship Surepost (Standard Shipping), orders going to Alaska or Hawaii aren't guaranteed to get there if you choose the standard $7.99 Continental U.S. shipping method. Please choose the ' Standard to Hawaii and Alaska - by UPS Ground ($20.00)' shipping method to ensure safe and guaranteed delivery. Your stamp will be made within 3-5 business days, but please remember to add an additional 5-7 days for standard shipping, depending on your location. We ship from Cleveland, Ohio. How do I insert my embosser die in the unit? How do I "lock" & "unlock" my embosser? 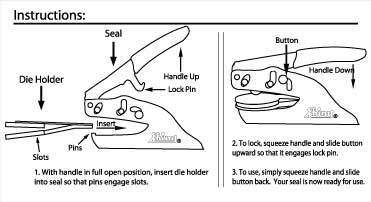 Please follow the instructions illustrated below to unlock your embosser. Our embossers are meant to be used on an envelope flap or on the bottom of your stationery. These are not made to be reversible.